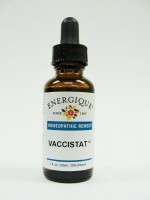 VacciStat is a homeopathic remedy for the detoxification of the system from commonly used vaccinations. May be helpful for the temporary relief of skin irritation, dry cough, eczema and fever. While it can't make vaccines more effective, VacciStat can help to reduce the negative effects associated with vaccination. Echinacea angustifolia 3x, Baptisia tinctoria 3x, Hydrastis canadensis 3x, Mezereum 12x, Antimonium tartaricum 12x, Thuja occidentalis 30x, Silicea terra 30x, Vaccininum 30x, Medorrhinum 30x, Malandrinum 60x, distilled water, 20% ethanol.